A reverse osmosis (RO) water filtration system removes undesirable (and along with them healthy minerals) dissolved inorganic solids (e.g. salt, minerals, metals) from water by transferring the water through a semi-permeable membrane. Even though RO systems remove most of the beneficial minerals, such as calcium and magnesium, along with the undesirable solutes, they are still one of the most effective ways of obtaining clean drinking water, especially if the goal is to get rid of fluoride in the water. Of course, it may be necessary to supplement your diet to account for the minerals stripped from your drinking water. Chlorine: Chlorine is used to treat water to prevent contamination. In fact it is required by the Environmental Protection Agency (EPA) for tap drinking water, the allowable chlorine levels being up to 4 parts per million. The benefits of chlorinated water do come with side effects (e.g. cancer) and that is why many people choose to have their drinking water filtered for chlorine. Even though it is important to use chlorine to treat water while it is being stored or in transit, it is often recommended that before human consumption the chlorine be filtered out, and the most effective way to do so is through a reverse osmosis system. Lead: Lead can enter drinking water in a variety of ways, the most common being the result of pipe corrosion where the piping material contains lead (even in small amounts). This is especially true where the water acidity level is higher. Houses built before 1986 are more likely to use such pipes, and are more susceptible to lead contamination of drinking water. Arsenic: If the presence of arsenic in the body goes past a certain level it can result in vomiting blood, presence of blood in the urine, cramping, and damage to the major organs within the digesting system. Cadmium: The presence of cadmium in drinking water can result in kidney damage, muscle weakness, and can produce flue-like symptoms. Cyanide: It reduces and eventually eliminates body cells from being able to process oxygen, and results in the elimination of the cells. If cyanide poisoning is left untreated, it can result in death. The process of reverse osmosis, due its nature, removes some beneficial elements from drinking water along with the harmful ones. Depending on the diet of those who drink RO filtered water regularly, it may be necessary to put back some (or all) of the healthy minerals removed by the RO process. Even though the stripping of water from these (and other) minerals could potentially be problematic, if those consuming RO water have an otherwise balanced diet, there should be no shortage of any of these minerals for a healthy body. It is recommended that any time a major change takes place in your diet or physical activity that a physician be consulted. Everyone’s body is different and may react differently to food and its environment. Generally, there are 5 primary stages of filtration, with one additional step added by certain RO systems to remove any taste that may result from the storage of the water in the RO storage tank. This is the first stage of water filtration and is designed to remove larger particles from the contaminated water. This stage removes particles such as dirt, rust (picked up from some water pipes), and variety of sediment. These are the activated carbon filters which remove undesirable chemicals such as chlorine, fluoride (not all filters remove this) and other organic chemicals. These two filtration steps are responsible for removing most of the bad taste and smell that may be present in the water being treated. The membrane which have pores small enough to only let through water molecules does a large portion of the water filtration work. 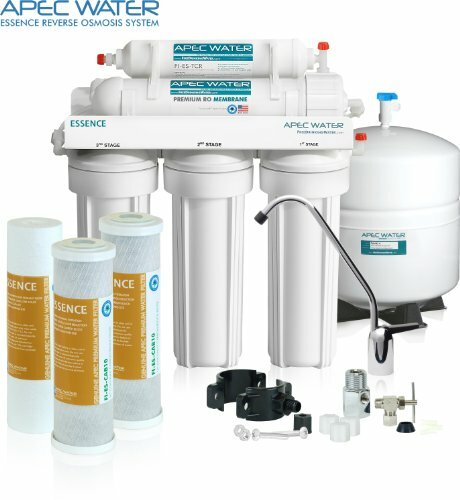 The membrane makes it possible to remove most dissolved solids (down to as much as 1/10,000 micron) from the water that is being fed through the reverse osmosis system resulting in the removal or reduction of such dissolved solids as arsenic, lead, copper, some parasitic cysts, and other such contaminants. The fifth stage of filtration is an additional step which some RO systems have. Even though is is not a requirement, it does result in better tasting water. Since most residential under-sink reverse osmosis systems utilize a balder tank to pump the water out of the faucet at a healthy rate, the holding tank can leave a rubbery taste to the water, and this is what the fifth stage in the RO filtration process removes. This fifth stage utilizes another activated carbon filter to remove the taste. Better Tasting Water: Since RO systems remove a large variety of chemicals and dissolved solids, water treated by RO systems will taste better compared to that straight out of the tap (in most situations). Reduced Chemicals: RO systems remove a large portion of undesirable chemicals and minerals including lead, fluoride, arsenic, rust, and chlorine. 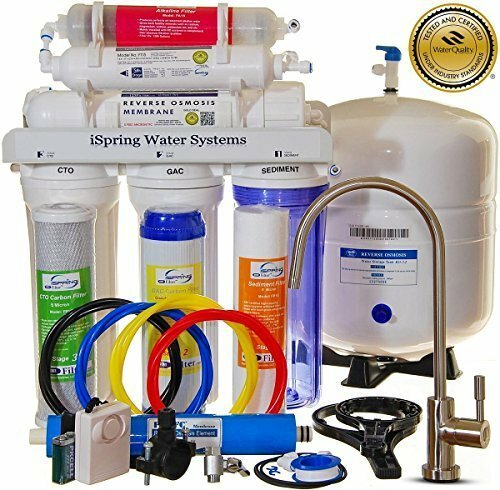 Low Maintenance: RO water filtration systems are low maintenance, as they require only filters to be changed once every 6-24 months, depending on frequency of use, quality of water, and type of filter. Efficient: Even though there is some water wasted through the filtration process, RO systems are highly efficient in producing high quality water. Affordable: With an initial investment of between $100-$300, and relatively inexpensive filters, the cost of having good quality water can be affordable for almost any budget. Revers osmosis water filtration systems are easy to maintain, as they do not require frequent cleaning and filter changes. Consult your RO system manufacturers recommended schedule for cleaning and filter changes. The below is a general guideline of what is required. Sediment Filter: Replace every 12 months. This portion of the RO system does the initial heavy lifting, so maintaining a consistent change schedule is important. Carbon Filter(s): Replace every 12 months. Responsible for removing chemicals such as chlorine, having a consistently replaced carbon filter will result in better-tasting water. Revers Osmosis Membrane: Replace 2-3 years. If the preceding filters are replaced on the schedule recommended by the manufacturer the semi-permeable membrane of the RO filter will only need to be changed every 2-3 years. Polishing Filter: Replace every 12 months. The final filter which removes the rubbery taste from the holding tank is an important final stage, and can impact the performance of the system if not changed based on the recommended schedule. Reverse osmosis systems by the nature of the way they function produce waste water. The amount of waste-water produced as a result of the RO filtration process varies based the water pressure of your municipal water system. The higher the pressure the less waste water the system will produce. Water temperature can also impact the amount of waste-water produced by an RO system—the colder the water the more water is wasted. All conditions being perfect an RO system will produce one gallon of waste-water for every gallon of filtered water. The amount of waste-water can be as high as four gallons per every gallon of filtered water. High Capacity Reverse Osmosis water filtration for safer, healthier water. 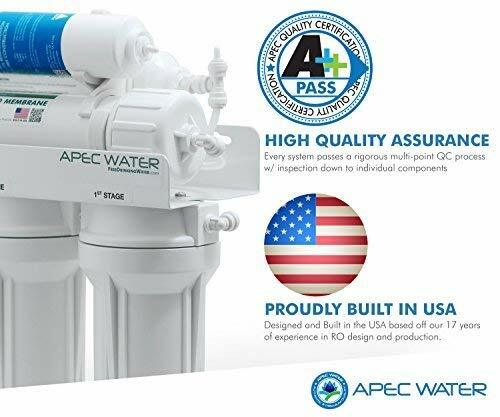 This under sink mounted water filter and water softener removes up to 99% of over 1, 000 contaminants, including lead (removes up to 98% of lead), chlorine, fluoride, arsenic, hormones, asbestos, calcium, sodium, bacteria, giardia, viruses and more. The RO membrane removes not only harmful pollutants but also a few helpful minerals. As a result, a standard 5 stage RO system produces slightly acidic water with a pH of 7. 0 or below. The iSpring RCC7AK includes an additional sixth stage - an Alkaline Remineralization filter which restores healthy minerals and produces a balanced alkalinity, which gives the water a more natural taste than regular 5 stage RO water.